Asmara, the capital of the small East African country of Eritrea, bordering the Red Sea, is one of the most important and exciting architectural 'discoveries’ of recent years. 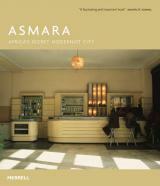 Built almost entirely in the 1930s by the Italians, who transformed it into a hotbed of radical architectural innovation, Asmara has one of the highest concentrations of Modernist architecture anywhere in the world. This superb building-by-building survey, illustrated with previously unpublished archival material and specially commissioned photography, chronicles the colonial past and remarkable survival of a city that has evocatively been described as 'the Miami of Africa'. Edward Denison is a design and architectural historian who has spent two years in Eritrea working with the Cultural Assets Rehabilitation Programme (CARP), an organization set up to identify, preserve and publicize the cultural assest of Eritrea. Naigzy Gebremedhin, one of Africa's most experienced and highly regarded consultants in the fields of architecture, engineering and the environment, is Director of the Cultural Assets Rehabilitation Programme (CARP), an organization set up to identify, preserve and publicize the cultural assets of Eritrea. Guang Yu Ren is a design and architectural historian who has spent two years in Eritrea working with the Cultural Assets Rehabilitation Programme (CARP), an organization set up to identify, preserve and publicize the cultural assest of Eritrea.